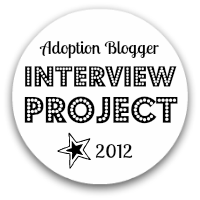 Received my match for the Adoption Blogger Interview Project. I am matched with Kohana of Growing Family at http://growingfamily.typepad.com/. I have not read much of her blog (yet) but will do so in the coming days. From what I gather she is an adoptive parent in a trans-racial adoption. She is also American and has a Dutch husband (I think?). She is currently living in Australia. The match was perfect IMO (hooray Heather!) and timely. Having just returned from the St. Johns Conference on Race, Religion and Rescue in adoption I can certainly speak more intelligently to the topic of trans-racial adoption. Oh, I am still woefully ignorant (being a white mother who surrendered her first born white baby to a domestic closed adoption). I am looking forward to learning from Kohana. I need to swap interview questions with Kohana by November 4 (and she needs to swap with me). We need to respond to each other by November 9. We will post our interviews on November 14. Soooo, check back here November 14 (or sooner if you want to read my St. Johns Conference Redux posts which will be coming soon!). So I blogged. Sort of. This entry was posted in About Me, Adoption Activism, Religion, St. Johns Adoption Conference and tagged adoption ignorance. Bookmark the permalink. I look forward to your reports on the conference, Suz. Know one person who went and she said it was great, long on facts, short on snark. She says she learned a lot about international adoption. So glad you’re excited about the pairing (and that you are participating in general)! And I used random.org to match up folks, so I’m afraid I can’t take any credit for it. What a great project! I wish I had known about it sooner, and I would have registered! Oh, well. Maybe next year. I received my interview match-up today and made contact. Looking forward to this! interesting how Heather connected first moms and adoptive moms, young and old (my match-up is a young mom, with one biological daughter and one adopted) and I am a 62 YO with no children except my relinquished son — and probably most of the other match-ups are from different perspectives. You likely saw Heathers comment that random.org did the matching. She collected the names but the output was random. I think its a great idea and encourages dialogue. Looking forward to hearing from my partner. I messaged her my intro. Now reading her blog and crafting questions.